This seemingly random measurement played a critical role in accomplishing what is still considered one of the greatest technological marvels of the 19th Century, the Transcontinental Railroad. Four feet, eight and a half inches is the width between the rails for all railroad tracks in North America. Were it not for the national adoption of the Standard Gauge, the Transcontinental Railroad would not have been possible. Upon its completion in 1869, the Transcontinental Railroad revolutionized the settlement and economy of the American West and made transporting passengers, goods, and mail coast-to-coast considerably faster and cheaper. Prior to its construction, as many as 20 different rail measurements were used across the country. Despite the obvious limitations this practice presented, many small, local railroads believed that their unique rail gauge was competitively advantageous. I am hardly the first to use the railroad analogy to describe the national interoperability disconnect. In many ways, the individual players pursuing national health information interoperability in 2019 are like those small, local railroad operators. There have been tremendous advancements made in health IT in the past decade. Yet despite this, national interoperability in the U.S. healthcare system remains frustratingly out of reach. Competitive self-interest and a fundamental lack of trust persists among the key players working toward this goal. Much of the blame and subsequent responsibility for this failure has been laid at the feet of the Health IT sector. But achieving national interoperability is not a question of technological capability. The technology required to seamlessly and securely share digital health information across disparate systems of care regardless of geography already exists. In many cases it is in use at state and regional levels today. All of the chatter about technology is a distraction from three fundamentals that are persistently missing from the larger conversation. Removing barriers for access to health records and empowering individuals with the information they need to make informed decisions is central to real healthcare innovation. However, none of that is possible without a genuine understanding of where patients are coming from and HOW they want to engage in their care. A consideration of context in the practical application of this ideal is essential to success. In addition to data access issues are the very real and pressing concerns including escalating and uncontrolled costs, the implications of social determinants of health (SDOH), and an enormous lack of health literacy in the general population, just to name a few. For the average patient, healthcare is extremely complex. It is not good enough to just provide patients with access to health information. We must provide accommodations and context. More than 20 years ago, the Health Information Portability and Accountability Act (HIPAA) demanded a national unique health identifier for every individual, employer, health plan, and care provider. Congress subsequently overturned this mandate due to concerns over personal privacy. Consideration of privacy and security in managing electronic health information is valid and critical. And there is a compelling case to be made against adding yet another layer of federal bureaucracy into the healthcare equation. However, these concerns need to be balanced against the vulnerabilities and associated costs incurred by medical errors resulting from a lack of dependable patient identification. Achieving real interoperability at a national scale is simply not possible without it. Because of how health information exchange was mandated and implemented according to the Affordable Care Act, today there are no common national standards regulating data access or operations for health information exchange activities between states. Each state system is unique. The result is a patchwork of public and private approaches with widely differing capabilities, scale, and sustainability. This dynamic highlights the need to focus concerted energy on bringing all states up to a minimum level of connectivity, and under a common regulatory umbrella. Without this, establishing national interoperability becomes that much more challenging. Patients and their advocates, the federal government, health care providers and their proxies, payer organizations, EHR vendors, and regional HIEs each play a vital role in reaching this goal. No single contributor possesses all of the resources necessary to do it by themselves. 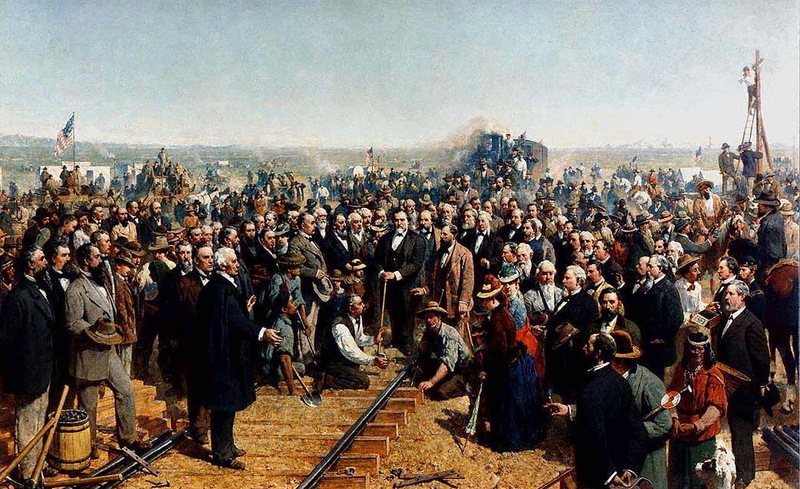 I would argue that, as was the case with the Transcontinental Railroad, the prosperity of each individual stakeholder is dependent on our ability to work together. The transformation of the U.S. healthcare system is not a zero sum game. One player does not automatically lose, when another gains. In fact, everyone wins in a system where information that makes a critical difference in the quality of care and outcomes is more accessible. Most importantly, patients win. Isn’t that what we are all working toward? Like on that monumental day in 1869, I believe we need to set aside competitive interests, and put a lot more energy into mapping out a route that gets everyone to the destination. Brian is a healthcare marketing strategist, with over 25 years of experience in various environments including Health IT, Long Term and Post-Acute, Family Medicine, and Managed Care. Mack joined Great Lakes Health Connect (GLHC) in 2014, and is tasked with driving the organization’s integrated marketing strategy and implementation, brand management, public & community relations, corporate communications, and social media curation and engagement. Brian is also a HIMSS Social Media Ambassador. Follow him on Twitter @BFMack. Read more guest blog posts on InterSystems PULSE.